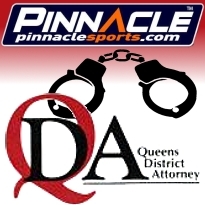 Twenty-five people across five states were arrested, and over $7.6 million in cash and chips were confiscated, on Wednesday and Thursday in connection with a $50 million bookmaking operation that may or may not directly involve Pinnacle Sports, a online sports betting site. Of those arrested, three (Brandt England, George Molsbarger, and Stanley Tomchin) are co-owners of Pinnacle Sports. Charges include enterprise corruption, money laundering, conspiracy, and gambling promotion in association with a betting ring that took tens of millions of dollars from people in the United States. The defendants could each face up to 25 years in prison if convicted. For more information on the individual arrests, read the LasVegas Review Journal article about the betting ring scheme. Arrests took place across the nation; departments in New York, New Jersey, Pennsylvania, Nevada and California assisted with the arrests. The district attorney’s office in Queens is prosecuting the case. It found that in an 18-month period, Pinnacle Sports raked in over $50 million in profit from bettors in the US while using servers in gambling-friendly countries. US bettors could place wagers over the phone or online at least four websites. The betting ring is then accused of hiding the flow of money by using dummy accounts and couriers to transport their cash profits to and from Costa Rica and Panama. Pinnacle Sports had supposedly left the US market after the passing of the Unlawful Gaming Internet Enforcement Act in early 2007. The NY investigation, however, claims that Pinnacle continued to operate the business via credit, letting gamblers settle up with agents acting allegedly on behalf of the prominent sports book. Gamblers settled up through cash exchanges. Another notable name of the arrested is Mike Colbert, the sportsbook director and manager at Cantor Gaming, a Las Vegas-based race and sports book operator that powers the race and sports books at the likes of the Venetian and Palazzo, M Resort, Hard Rock Hotel and Casino, Tropicana, and two others. While a Cantor spokesperson denies any company involvement, the Las Vegas Review-Journal reported that the Nevada Gaming Control Board is investigating the company for “possible regulatory violations”. Calvin Ayre identified the other sites involved in the betting ring as jazzsports.net, jazzsports.com, wager4you.com, and playhera.ag. Read the full indictment here.